It's hard to believe that in the early days of television, brewers were initially wary of advertising their products on the air. With Prohibition still a relatively recent memory, many thought advertising beer on TV would be in bad taste. Commercials of this type were initially restricted to evening showings only, with Sundays completely off limits. However, with television sets quickly becoming a fixture in bars and taverns, advertisers realized that they had a unique opportunity to market directly to their customer at the barstool. 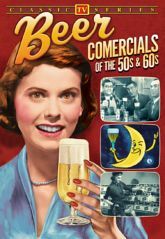 So beer commercials became a fixture in the landscape of 1950s and 60s television, with companies scrambling to sign up beloved celebrities to pitch their product. Some of the famous faces who show up in this compilation, extolling the virtues of their favorite brands, include Jackie Gleason, Ed McMahon, Buster Keaton, Ray Milland, and Mel Allen. You'll also hear the instantly recognizable voices of Paul Frees, Jackson Beck, Jimmy Wallington, and Danny Dark.